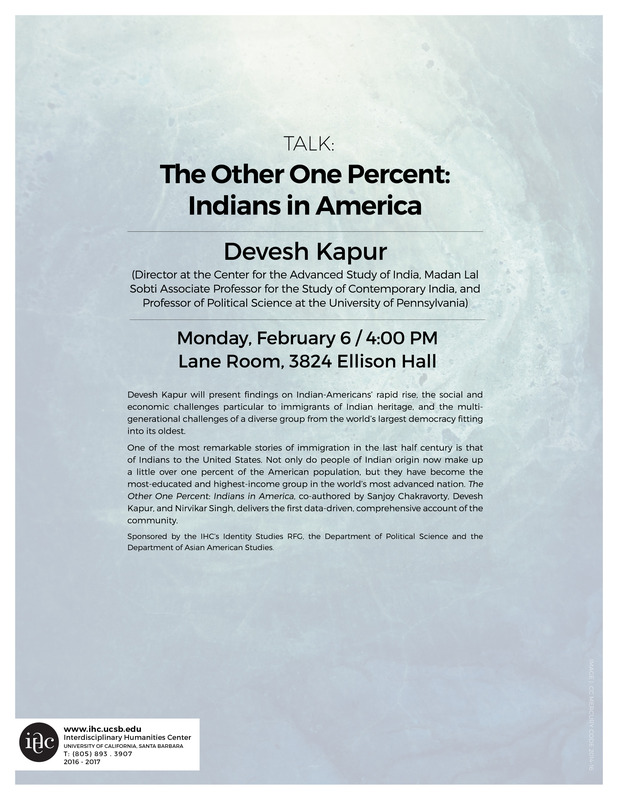 Devesh Kapur will present findings on Indian-Americans’ rapid rise, the social and economic challenges particular to immigrants of Indian heritage, and the multi-generational challenges of a diverse group from the world’s largest democracy fitting into its oldest. One of the most remarkable stories of immigration in the last half century is that of Indians to the United States. Not only do people of Indian origin now make up a little over one percent of the American population, but they have become the most-educated and highest-income group in the world’s most advanced nation. The Other One Percent: Indians in America, co-authored by Sanjoy Chakravorty, Devesh Kapur, and Nirvikar Singh, delivers the first data-driven, comprehensive account of the community. Sponsored by the IHC’s Identity Studies RFG, the Department of Political Science and the Department of Asian American Studies.